As regular readers of Friday catblogging know, I don’t use my camera’s flash very often. Mostly that’s because I just don’t like direct flash much, but it’s also because “laser eye” in cat pictures is far worse than red eye in human pictures. You have to shoot from a pretty extreme angle to avoid it. But sometimes you gotta do what you gotta do, and last night was one of those times. 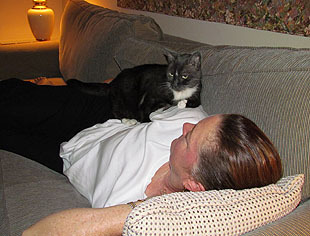 On the left, Marian is tuckered out on the sofa and Domino has decided she makes a pretty good bed. 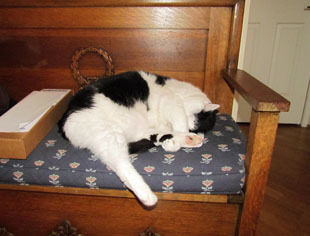 On the right, Inkblot has churned through his usual cycle of favorite places and decided that the antique bench is once again his favorite place. That should last another week or so. They’re so cute when they drape a paw over their eyes, aren’t they?